How would musicians at a current Methodist church respond to the Rules required of members of the chapel Choir in one of the three Primitive Methodist chapels in Loughborough? 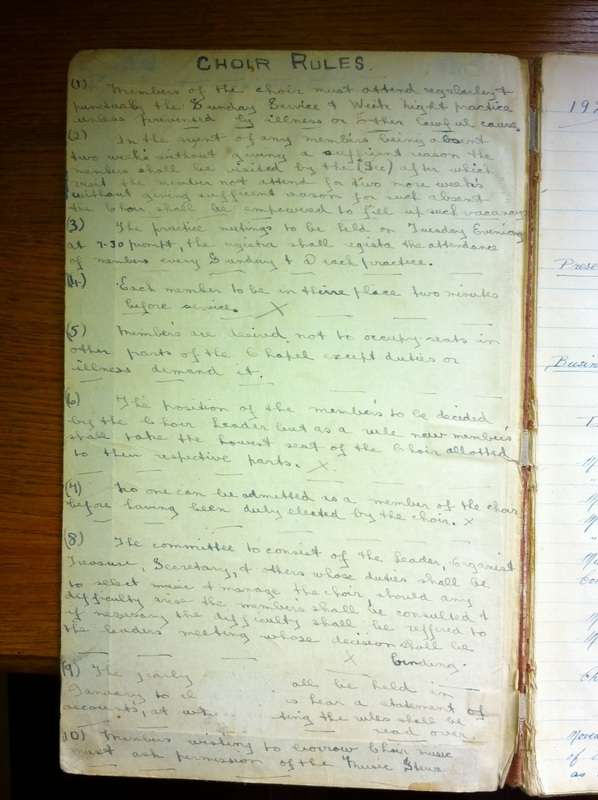 The rules are taken from the Minute Book of the Choir at Nottingham Road, Primitive Methodist Church. These rules were written on the first page of the Book. The first meeting recorded in the Book was held on January 27th, 1920. The Minute Book continued to be used until the 1970s and in 2015 lives in the organists’ cupboard in Loughborough’s Trinity Methodist Church where I found it by chance when looking for a tune we had not used for a long time. Choir rules of Nottingham Road Primitive Methodist chapel, Loughborough, together with names of those attending the 1920 AGM.